Geophysics is the study of the physical properties of the Earth. For this project, we are measuring the magnetic field and natural radioactivity of the soils and rocks of the south west of England. 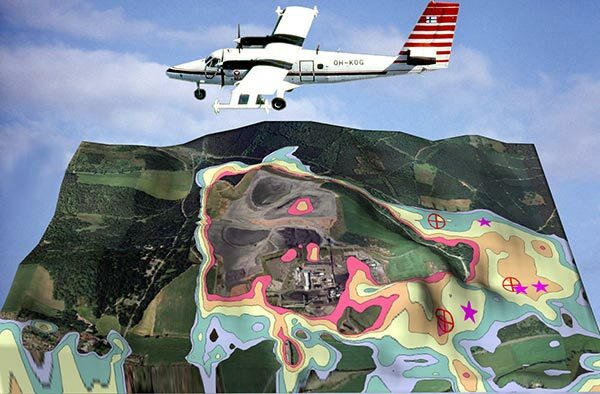 Aerial geophysical surveys can reveal both magnetic and radiometric data of the subsurface. 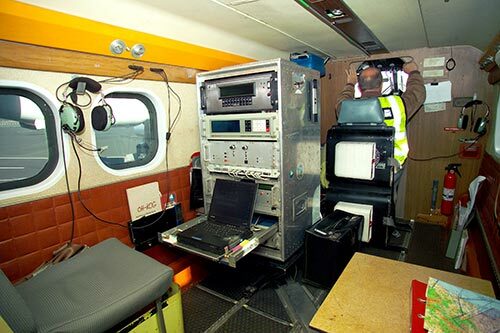 The equipment on board the aircraft that is used to monitor and collect information during the flight. This image shows a compilation of magnetic survey data. The processing has been tuned to show the regional extent of the shallow dyke swarms of the North Atlantic igneous province. Magnetism is measured from the aircraft by magnetic sensors that measure the perturbations in the Earth’s magnetic field created by the rock structure of the subsurface. Most rocks are slightly magnetic, and differences in the measured magnetic field indicate variations in the type of rock and soil beneath the aircraft. It can also help identify the presence of deep geological structures, display shallower effects of magnetic rocks near the surface and indicate faults and volcanic intrusions acting as barriers or pathways to groundwater or the movement of pollutants. Distribution of the artificial radionuclide caesium-137 across Northern Ireland and part of south west Scotland. Natural and artificial radioactivity is measured using radiometric sensors. All rocks and soils are very slightly radioactive, with most terrestrial radiation coming from isotopes of uranium, thorium and potassium. The proportions of these isotopes vary between rock types, which means we can characterise particular rock and soil types. The radioactivity map also provides us with a baseline with which to measure any future change in ground radioactivity. Prominent anomalies can also show us the location of intrusive rock complexes. We can identify areas prone to high levels of radon and locate any contamination from industrial radioactive waste and caesium fallout from Chernobyl.